The Nelo Coach App will help you be the paddler you want to be. The Nelo Manager App will let you focus on what's important when coaching. 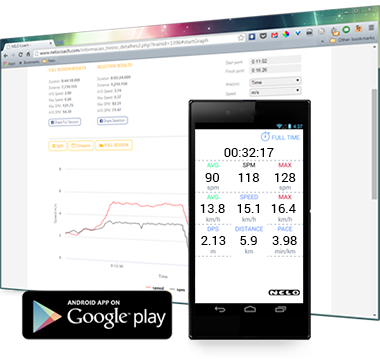 Take your mobile device with you for your training session and get realtime feedback on how fast you are going, what’s your stroke rate, your times and much more. Create tags at crucial points for post-analysis. Your session data will be uploaded to your account on this site where a wide range of analysis tools are available. Divide your session in smaller sections, access full and per lap totals, split by distance or time with partials, among many more features. Evaluate how you’re progressing by comparing training sessions or laps.The comparison chart allows you to quickly measure your progress and check where you can improve.